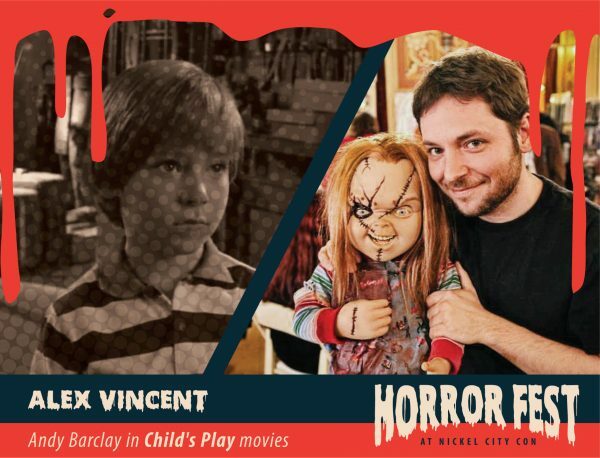 Alex Vincent was born in New Jersey. He first appeared as Andy Barclay in Child’s Play (1988) when he was a six-year-old. He has played the character in Child’s Play, Child’s Play 2 (1990), Curse of Chucky (2013), and Cult of Chucky (2017). He is the owner and producer at AV Productions Recording Studio and Production Company in Clearwater, FL. In addition to his role of Andy, Vincent has appeared on television in commercials, daytime dramas, and in the feature film, Wait Until Spring, Bandini (1989).